Happy St. Patrick’s Day! Make sure you find your pot of gold by celebrating responsibly; don’t drink & drive. Wishing everyone a happy and safe St. Patrick’s Day! Lancaster Sheriff's Station reminds everyone to celebrate responsibly. Please don’t drink and drive. Plan ahead, prepare to call an Uber, Lyft, taxi service or designated driver. 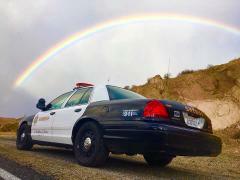 Make sure you get home safely so you can still find your pot of gold at the end of the rainbow.